Our Michigan pedestrian accident lawyers can help you if you or someone you care about was hit by a car or struck by some other motor vehicle. We represent pedestrians injured in motor vehicle accidents on streets, highways, roadways, sidewalks, parking lots and in crosswalks. Injured pedestrians can file lawsuits for compensation for the injuries suffered in the accident. These claims often result in large settlements. In cases involving a pedestrian death, our attorneys will file a wrongful death lawsuit for the surviving family members. Compensation in a fatal pedestrian accident case is for the pain and suffering prior to the death and the loss of companionship of the loved one. If the decedent provided economic support to family members, a claim for those financial losses is also sought. Do I Have To File A Police Report After A Pedestrian Accident? Michigan law requires drivers to report any accident involving a motor vehicle that results in death or injury. A written report is not always required. 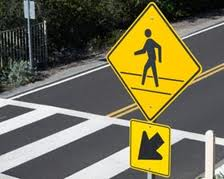 For pedestrian accidents, the police are usually called to the accident scene to do an investigation and complete a report. If a driver leaves the scene of a pedestrian accident, the police will pursue hit and run criminal charges. A pedestrian hit by a car in a private business parking lot may need to go to the police station and file a report if the police do not show up to investigate the incident. Many insurance company policies require that you file written report with a police agency within twenty-four hours of the accident to qualify for insurance benefits. How Can I Get My Police Accident Report? You can get a copy of your pedestrian accident report (UD-10) from the police agency that investigated the accident. For accidents investigated by the Michigan State Police, you can purchase your report online through the Traffic Crash Purchasing System. When Should I Report The Accident To My Own Insurance Company? Pedestrians injured in motor vehicle accidents should contact their insurance company immediately to notify it of their injuries. For injuries that require medical treatment, you will need to file an Application for No-Fault Insurance Benefits. Injured pedestrians that did not own an automobile or have a car insurance policy can still file a claim for No-Fault insurance benefits. Video: What Are Michigan No-Fault Insurance Benefits? No-Fault insurance benefits are benefits you are entitled to receive under Michigan law, regardless of fault, if you were injured in a pedestrian accident that arose out of the ownership, operation, maintenance or use of an automobile as an automobile, such as a car or truck. These benefits include wage loss benefits for the first three years after the accident, assistance with household chores for the first three years after the accident, unlimited lifetime medical expense coverage, mileage to and from doctor appointments, attendant care and other benefits such as home and vehicle modifications. Do Pedestrians Struck By Cars Get No-Fault Insurance Benefits? Injured pedestrians always get No-Fault insurance benefits under Michigan law even if the person did not own an automobile or have an auto insurance policy. Benefits will either come from your own car insurance, the car insurance of a family member, or from the insurance company of the negligent driver that you on the bike. If none of these people had insurance, you can get benefits through the Michigan Assigned Claims Plan. Our attorneys will determine which insurance company must pay your benefits. We will help you fill out all of the forms and then submit them to the insurance company for you. We will deal with the insurance adjuster to make sure that all of your benefits get paid. Do I Still Get No-Fault Benefits If I Was At Fault For The Accident? You can receive all No-Fault insurance benefits even if you were at partially or totally at-fault in the accident. This is true even if you were unlawfully crossing the street when hit by the car and even if you were under the influence of alcohol or drugs at the time of the accident. An insurance company cannot deny your benefits if the accident was your fault. What Are My Rights For A Hit And Run Accident? If the other driver fled the scene after hitting you with an automobile, you can still receive No-Fault insurance benefits. You may also have a claim under either your own or a family member’s car insurance policy for uninsured motorist benefits. Our lawyers will sort these claims out for you. Can I Sue The Driver That Hit Me With A Car? You can sue the negligent driver for your personal injuries suffered in the accident. You can also sue the owner of the vehicle driven by the at fault driver. These claims provide money compensation for your pain and suffering, psychological damages, disability, and scars caused by the accident. How Much Time Do I Have To Sue Someone For A Pedestrian Accident? Under Michigan law, the time limit to sue someone for personal injuries for a pedestrian accident is three years from the date of the accident. This is known as the Statute of Limitations. The period may be extended longer if the injured person was a minor at the time of the crash. What Are The Claims In A Pedestrian Accident Lawsuit? In a case involving the death of the pedestrian, the surviving family members can file a wrongful death lawsuit. These cases seek damages for conscious pain and suffering of the bicyclist from the time of accident until death, the loss of society and companionship of surviving family members, loss of income and support, and other economic damages. What Is The Average Settlement For A Michigan Pedestrian Accident? There is no “average” pedestrian accident settlement that is used as a basis for determining the payout amount in your case. Every claim is completely different and based upon a number of factors. How Much Can I Get For Pedestrian Accident Settlement? The amount of your settlement will depend on the seriousness of your injuries, the type and length of your medical treatment, and how the injuries have affected your ability to lead a normal life. Other settlement factors include whether you had an excess loss of income, a loss of future earning capacity, and the permanency of your injuries. The insurance policy limits of the negligent motorist and other potential sources of insurance coverage are also a major factor in determining the amount of your settlement. $4,500,000 wrongful death settlement for the family of a young man was struck and killed by a septic truck driver driving in reverse in Oakland County. The driver and ran him over and caused fatal injuries. $3,825,000 pedestrian death settlement. The victim was killed after being hit by a truck while crossing an intersection. $1,250,00 settlement for a pedestrian critically injured after being struck by an SUV in Grand Rapids. The victim suffered a traumatic brain injury and other disabling injuries. $1,080,000 settlement for a man hit in a crosswalk by a driver under the influence of alcohol and marijuana. $1,000,000 settlement against a trucking company for a pedestrian run over by a semi-truck in Marshall, Michigan. The pedestrain suffered a traumatic brain injury, multiple orthopedic injuries, ruptured spleen, and required a leg amputation. Do I get Michigan no-fault benefits if I did not have car insurance? Who is responsible for paying my medical bills and expenses? Can I get paid my lost wages for time missed from work? How much of a settlement can I receive for my pedestrian accident? Do I have a pedestrian accident claim if I was hit by an uninsured driver? Can I file a lawsuit if it was a hit and run pedestrian accident? Do I Get No-Fault Insurance Benefits For A Michigan Pedestrian Accident? Michigan No-Fault insurance benefits are automatically available to every pedestrian injured by a motor vehicle. Every injured pedestrian can get these benefits even if they did not own a vehicle or have a No-Fault Insurance policy. No-fault benefits include payment of medical expenses, prescription expenses, and hospitalization costs. These are lifetime benefits regardless of the amount of the expense, as long as the charges are necessary and reasonable. Other insurance benefits include payment of lost wages, household services, attendant care services, medical mileage, and transportation to and from medical appointments. In cases involving more serious injuries, the insurance company is required to pay to modify a home and vehicle to accommodate the special needs of the accident victim. Can A Pedestrian Injured In A Hit & Run Accident Receive No-Fault Benefits? Yes, pedestrians hurt in a hit and run accident are entitled to receive no fault benefits. If the injured pedestrian had an auto insurance policy, the claim would be made against that policy or against the auto insurer of a resident relative. If there was no auto insurance for the pedestrian or a member of the household, the claim is made against the Michigan Assigned Claims Plan. How Do I Apply For No-Fault Insurance Benefits? The first step is to determine which auto insurance company is legally responsible for paying no-fault benefits. There are numerous factors that go into this and our experienced attorneys will make this determination for you. Once the insurance company is identified, we will file your Application for No-Fault Benefits with the company. We will then assist you in filing all of the necessary claim forms to the adjuster and monitor the claim to guarantee that all benefits are paid. Who Pays The Settlement Compensation For A Pedestrian Accident? The settlement payout usually gets paid by the insurance company for the driver and the owner of the car that hit you. Often, there is more than one insurance company to pay a settlement. This can result in a much larger settlement because there is more insurance coverage to pay your claim. If the driver and vehicle had no insurance, you may still be able to get a settlement under an uninsured motorist claim in either your own auto insurance policy or from a policy of a family member. Our attorneys will fully investigate all possible sources of insurance to get you a settlement. How Long Does It Take To Get A Pedestrian Accident Settlement? The length of time that it takes to get paid a settlement varies on a case by case basis. Some cases settle quickly because the injuries are serious and the insurance policy limit is low, so the adjuster will pay the entire policy limits quickly. However, most cases can take up to a year or more after the accident to get a settlement check because the victim is still recovering and the future effect of the injuries are unknown. It is not wise to settle a case before the long term impact of the injuries is known. Beware of lawyers promising fast settlements. This usually means they are putting their own interests before your best interests and want to make a quick fee and then leave you to handle your No-Fault Insurance claims on your own. This is a common tactic of many TV lawyers. How Long Does It Take To Get A Settlement Check? In most cases, you should receive your settlement check within thirty days of signing the Settlement Release Agreement and sending it back to the insurance adjuster or defense attorney. Do I Need A Lawyer To Settle My Pedestrian Injury Case? You can always try to settle your injury case without a lawyer. However, studies show that injury victims receive much higher settlement awards when represented by an experienced attorney and end up with more money for themselves even after paying the lawyer fees. If you try to settle the case on your own, you should just be aware of any releases or papers that you will be required to sign by the insurance company. The documents may contain language that will get you to give up your important legal rights forever. You should also beware that the adjuster may not tell you the real insurance policy limits or other available types of insurance coverage that could bring you a larger settlement. Once you sign a release of claims, you are stuck with your settlement even if you later find out there were higher policy limits or other sources of insurance that could have paid you much more money. How Much Does It Cost To Hire A Pedestrian Accident Attorney? It does not cost anything to hire our pedestrian accident lawyers. We do not charge any fees to start your case and only get paid when you receive your settlement check. This is called a contingency fee agreement. Under this arrangement, we also pay all of the case expenses for you and get a percentage of the settlement at the very end of the case when your check is received. Do I Have To Pay My Lawyer If You Lose My Case? We will represent you in your pedestrian accident case under our no-fee promise. This means that you will not be charged any legal fees whatsoever unless we obtain a settlement or recovery for you. You have absolutely no obligation for legal fees unless we win your case. If we do not obtain a settlement for you, you owe us nothing. Call (800) 606-1717 now to speak with our award-winning Michigan pedestrian accident lawyers about your case. We will explain your legal rights to you and help you file all of your claims with the proper insurance companies. It will cost you absolutely nothing to speak with an attorney about your situation so you have nothing to lose. If you or someone you know was the victim of a pedestrian accident in Michigan, you can download our FREE guide, "The Ultimate Michigan Pedestrian Accident Guide" by Lawrence J. Buckfire. This guide helps you understand your legal rights if you were injured in a pedestrian accident, and will explain the secret deadlines that will destroy your case if you delay in hiring a lawyer. The guide sells for $14.95 on Amazon, but you can download it immediately for FREE. There were 2,349 Michigan auto crashes involving pedestrians in 2016. These resulted in 1,852 injuries and 165 pedestrians killed in these accidents. The most common pedestrian accident before a crash was not crossing at an intersection and this resulted in the highest number of fatalities. The highest percentage of accidents occurred between 6:00 - 7:00 p.m. He (Larry Buckfire) was the one that was willing to come talk to me first. Buckfire & Buckfire was able to help me with home modifications and the attendant care... They helped, a lot. I've been able to get caught up on bills, settle down, and know that I have a reliable income coming in. ?Who is best lawyer in Michigan for a pedestrian accident lawsuit? ?My son was run over by a car in Michigan and suffered serious injuries. Can I sue that driver? ?Can a pedestrian injured in a car accident receive Michigan No-Fault Insurance benefits ?